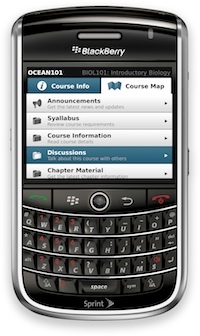 Blackboard Mobile Learn on BlackBerry. It will also support iPhone and Android. Blackboard is preparing to release Blackboard Mobile Learn, a new version of the company's flagship learning management system tailored for smart phones and other mobile devices. It will debut as a native application for Android, iPhone, BlackBerry, and "other Web-enabled devices" in the late spring. Mobile Learn, according to Blackboard, will move beyond the company's current mobile offerings and will mimic the full functionality of the Web-based Learn platform, including two-way communication between students and teachers, access to gradebooks, blog access and commenting, discussion board participation, and student-to-student e-mail communications. Blackboard said that the initial offering will be for higher education institutions and professional schools using Blackboard Learn 8.0 or later. The company said Mobile Learn will also be available for K-12 institutions down the road and that it will eventually support institutions that are using Angel and WebCT systems, as well as those that are on versions of Blackboard's software prior to 8.0. Mobile Learn will be available via an annual license and will allow schools to apply their branding to the interface. A Blackboard Building Block to enable Mobile Learn is available as of today on Blackboard's support site. "Campuses are seeing increased demand from students and faculty who want to do more on their mobile devices," said Blackboard President and CEO Michael L. Chasen in a prepared statement released today. "By partnering with Sprint we're making it easy for clients to get started fast, without having to worry about startup costs that might otherwise delay progress in this important area." Sprint will be launching an awareness campaign for the partnership, which will include an "outreach toolkit that participating clients can use to spread the word on Blackboard Mobile Learn, Sprint's device portfolio and discounted plans at their institution." Further information about Blackboard Mobile Learn can be found here.